The Day 1 Summary written by Nancy Carrillo outlines the sessions and speakers of the day. 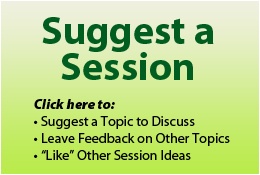 If you attended any session listed below or you have thoughts on the subject, click on the title and feel free to share your experience, notes and comments. New to Environmental Evaluation: What do we need to know? Return On Investment: Sin? Savior? Both? Neither? Environmental education programs: What are we measuring? What is AEA’s role to support environmental consciousness and responsibility? The Day 2 Summary written by Ken Stricklett outlines the sessions and speakers of the day. Join over 200 colleagues July 18 and 19 at American University in Washington, DC for the US Environmental Evaluators Network Forum Unconference. What are the responsibilities and opportunities for environmental evaluation to serve the public good? What facilitates and what impedes the discipline of evaluation and its practitioners in achieving environmental ‘public goodness’? How should ‘public good’ even be defined? These are some of the questions we hope you will help us wrestle with at the 7th annual US Environmental Evaluators Network Forum. The US EEN and the American Evaluation Association (AEA) are hosting the event as an ‘unconference.’ This format is participant driven, lively, and creative. Participants in the unconference determine its content during the event! Are you working with or in an agency or organization that implements environmental programs and policies? Do you evaluate environmental programs and/or policies? Are you concerned about evaluation being used for the public good? This event is for you. Our goal is to connect you with other innovative environmental evaluators to share experiences and ideas, explore new trends and opportunities, and brainstorm out-of-the-box solutions to the challenges we’re all facing. View pictures from the 2012 EEN Unconference!